Produktinformationen "Booster -2XL- Vlies Formvorlage ,ohne Folie ,Einzelstueck"
The unique wider design of this pad effectively contains larger amounts of fluid and bowel incontinence. The flow-through top and back sheet allows the liner to fill to capacity then pass additional fluid to the host garment. The soft texture makes clean up easier. Contour booster pads are convenient to change, easy to dispose of, and economical. Latex-free. Booster pad inserts are an economical and effective way to increase the capacity of any absorbent product. 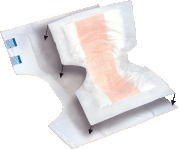 We offer them in two brands and six styles to accommodate absorbency requirements from moderate to extremely heavy. At a full 6 inches wide and 24 inches long, the Abri-Let Maxi covers a 250% larger area and offers twice the thickness of a conventional booster. It is specially designed to provide compete front-to-back coverage while fitting neatly between the leak guards on medium, large and XL size briefs. Weiterführende Links zu "Booster -2XL- Vlies Formvorlage ,ohne Folie ,Einzelstueck"